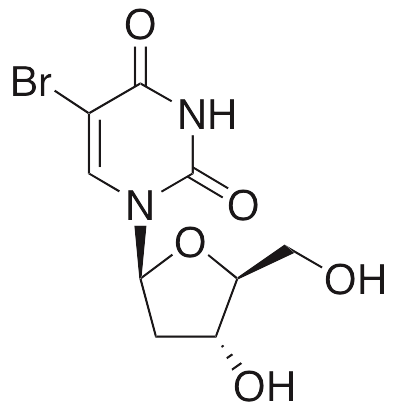 5-Bromo-2’-deoxyuridine is a synthetic nucleoside analog of thymidine that is used in research models to label actively proliferating cells. This compound is incorporated into DNA but at low levels does not alter DNA replication. At high levels, this compound displays immunosuppressive activity and has shown some anticancer benefit when used as a chemotherapy radiosensitizer. Soluble in dimethyl- acetamide, 1N NaOH, or DMSO. Slightly soluble in water. Zhang R, Zhang J, Fang L, et al. Neuroprotective effects of sulforaphane on cholinergic neurons in mice with Alzheimer's disease-like lesions. Int J Mol Sci. 2014 Aug 18;15(8):14396-410. PMID: 25196440. Jeong CH, Kim SM, Lim JY, et al. Mesenchymal stem cells expressing brain-derived neurotrophic factor enhance endogenous neurogenesis in an ischemic stroke model. Biomed Res Int. 2014;2014:129145. PMID: 24672780. Russo A, Gianni L, Kinsella TJ, et al. Pharmacological evaluation of intravenous delivery of 5-bromodeoxyuridine to patients with brain tumors. Cancer Res. 1984 Apr;44(4):1702-5. PMID: 6704976.